With its rugged-looking interface and sample videos depicting slowed-down mountain biking and ski jump shots, SloPro seems to cater to a particular set of X Games surf/snowboard/skater enthusiasts. But even if you don’t generally shoot fast action sports videos, SloPro is fun to use. With a few taps, you can speed up or slow down video of any subject—from a passing cityscape to a child blowing out her birthday candles—without relying on desktop video-editing software like iMovie or Final Cut Pro. There are some limitations to what you can accomplish with SloPro, and editing can be annoying, but the app produces cool results. 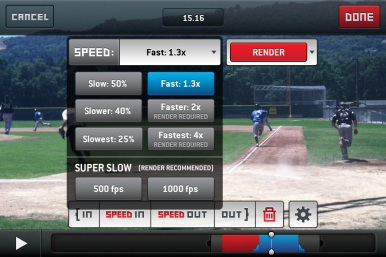 SloPro takes the pain out of manually speeding up or slowing down video, allowing you to quickly generate those effects directly on your iPhone or iPad. Extra-smooth slow motion, a new feature with the current update, is only available for the iPhone 4S, though the app is compatible with all devices running iOS 5.0 or later. Ready, set, go: Speed options are preset, with additional rendering options (optical flow, frame blending, ghosting) that minimize video choppiness. The process of slowing down video is easy, but you are restricted to preset speeds. The Speed drop-down button at the top of the Edit screen lists a decent number of choices for speeding up and slowing down recorded clips, including super-slow settings that render your video a painstaking speed of 1000 fps. With the eight options you’re given, you can speed up footage as fast as four times the shoot speed or slow it down to 1/4 the shoot speed without additional rendering. It’s not a major hindrance if you’re just out for a cool effect, but if you’re trying to achieve more specific timing, you may be disappointed. Access a video either from your device or record directly via the app. Definitely record from your phone through SloPo if you have an iPhone 4S, which captures footage at 60 fps instead of the 30 fps you'll get by recording from SloPro with another iOS device. (The iPhone 4S captures twice as many frames per second through SloPro, so slow motion video appears smoother.) If you’re recording with SloPro at a slowed speed, you can revert back to the live-action speed at any time while shooting or editing—a wonderful feature. 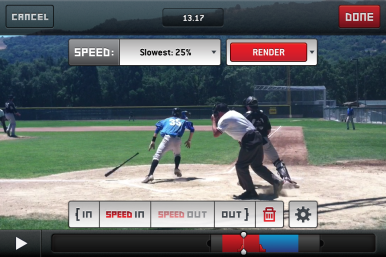 From the Edit screen, tap Speed In where you want an effect to start; tap Speed Out where you want it to end. When you click on that section, you can change the speed or add smoothing options. The wait time for the effect to take place is minimal, and you’ll quickly see the creative possibilities for shooting everyday scenes, especially when speeding up and slowing down different sections within the same video. Color-coded editing: It's quick and easy to see where effects have been placed. Red means a scene has been slowed down, blue means a scene has been sped up, and orange means that a scene has been treated with a super-slow effect. Though it's super-easy to edit video when you want to utilize only one effect, the app can be irritating when playing around with different effects. Say, for instance, you've already added an effect to a segment in your video, but want to add a different effect to the middle part of that segment. Essentially, you have to run through the entire editing process again. Tap Speed Out, then Speed In where you want the new effect to start; tap Speed Out, then Speed In where you want the original effect to resume; and tap Speed Out where you want the original effect to end. It sounds simple enough, but sometimes it's difficult to remember exactly where you want each edit to go. Unfortunately, there's no Undo button, which would really come in handy when you accidentially tap Speed In instead of Speed Out, or vice versa. I often found myself voiding all edits made in a particular clip (by tapping Cancel), rather than struggle to revert back to my previous edits. Anything shot with the free version leaves a small Made with SloPro for iPhone watermark—annoyingly and inaccurately, even when you’re shooting from an iPad—at the bottom of the screen. This might induce you to fork over $4 for the Pro Upgrade, but if you’re only looking to show your friends how awesome a scene looks in slo-mo, it’s probably unnecessary. With the free version, you can still export your videos to Facebook and YouTube, though you must purchase the upgrade to email your movies or export them onto your Camera Roll or iTunes. So in order to add background music or make additional edits to your film, you’ll need the paid version. Whether or not you aspire to direct action flicks à la Michael Bay, SloPro - 60fps Slow Motion Video warrants a download. You'll get cool effects fast and (relatively) easily, on video shot from your device or regular camera. With SloPro, testing effects and seeing their results is a game, and for the most part, it's a fun one.